chocolate vanilla cookies! (GAPS legal)! I recently hosted a fermented veggie swap and these cookies I served at the party were a hit! Everyone one was asking for the recipe. I don’t usually use recipes, I just use my instinct, so I had to recreate the recipe and it turned out the same, so I guess remembered how to make them. 1. Mix the almond flour, coconut flour, salt, cinnamon in a mixing bowl. 2. In another bowl mix eggs, vanilla, and honey. 3. Pour the liquid ingredients into the dry bowl. 4. Stir until mixed and let sit for a few minutes to let the coconut flour soak up completely. 5. Carefully and quickly mix in the GAPS chocolate drops, so they don’t melt and make the batter totally chocolate! Your cookies look absolutely delicious! 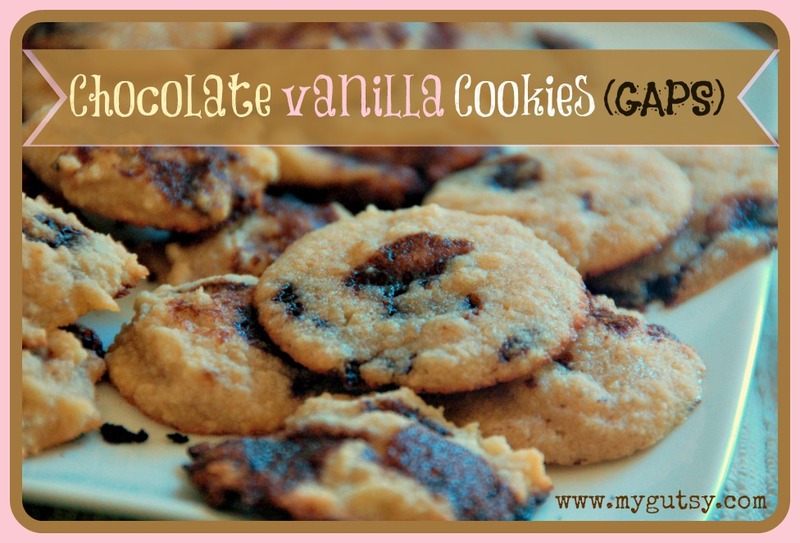 I love the chocolate / vanilla combo, and all the wonderful wholesome ingredients you have used. Mmm, these look amazingly delicious! These are going on my Pinterest board for later. Thanks for sharing at Tiny Tip Tuesday! thanks 🙂 they are yummy! Now these are some tasty cookies jam packed with protein! Thank you for sharing this yummy treat on Allergy-Free Wednesdays. Sorry- I will do ONLY coconut flour things. a lot of people can’t have nuts I am realizing, so I will use coconut flour more often in my recipes. Beware that coconut flour uses a lot more eggs and you need only a little bit to go along way! Thanks for the recipe Caroline! My 4yo loved them so will be excited when I get around to making them 🙂 Did the ones we tried have stevia in them? I only have a bit of the green powder stevia from the coop bulk section. Looks good, but what is the amount of honey/maple syrup to add:1/2 ? sorry. 1/2 cup! just fixed it, thanks. No butter or coconut oil?